You don’t have to be computer savvy to understand the vision of Steve Jobs. 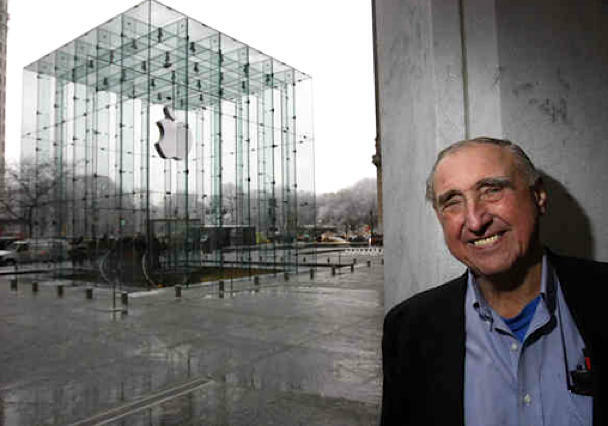 Architect Peter Bohlin who designed Apple’s epic glass cube for the Fifth Avenue store in New York is “a total computer illiterate” his partner Bernard Cywinski told the Philadelphia Inquirer. He still sketches on paper rather than by computer and prefers talking in person to text messages. Yet Bohlin interpreted Jobs’ wish to create a kind of “clubhouse” for Apple fans so well that the Cube has become one of New York’s most-photographed landmarks. Even though he’d never designed a retail space, Jobs chose Bohlin to design this Manhattan magnet for Apple lovers based on his work for the new Pixar headquarters and studios in Emeryville, California. Jobs “didn’t care” about that handicap, said Karl Backus, the principal in BCJ’s San Francisco office who manages the firm’s Apple projects. That’s because Jobs thought of the stores not as retail spaces but as social spaces. Jobs believed it was more important for the stores to offer a unique and compelling experience, in much the way that a Frank Gehry-designed museum does. Otherwise, why would people bother to make a special trip to buy a product they could order more easily on the Web? “The best thing about that building is its narrow profile. So I thought, ‘What is the inevitable shape to contrast that?’ ” Bohlin said. And voilà: the Cube, which currently ranks number five in New York landmarks, according to a Cornell University study of 35 million Flickr photos. Bohlin’s work for Apple helped earn him the 2010 gold medal from the American Institute of Architects, where his use of for his versatile, contextual use of materials was praised. In July, another Apple store of Bohlin’s design will open in Philadelphia. Does the Cube merit its position as a top NY landmark?